Advanced Energy Panels are not storm windows, nor are they a replacement window. Rather, they are a basement window insulation system -- one that seals your windows with a subtle and highly effective solution. This patented system is designed with a sturdy aluminum frame and two heavy-duty layers of glazing that work together to trap a 7/16" pocket of air between them. They install on the inside surface of your basement window, blending in with your window framing seamlessly. Once installed, these panes trap an additional air space between the panel and your existing window for further energy efficiency. A layer of weather stripping will seal the panel to eliminate drafts and create a thermal barrier. Each panel can easily be removed and replaced for cleaning. Installation of Advanced Energy Panels is quick and non-invasive to your home. Once installed, this technology triples the insulation value of your windows! We can provide you with a simple, common-sense solution for insulating your basement windows! Call us for a free basement window insulation quote today! 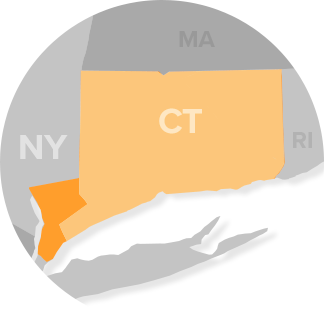 We service Stamford, White Plains, Norwalk, Danbury, New Haven, Springfield, Holyoke, Westfield, Greenwich, Mount Vernon, Norwich, Groton, Torrington, Trumbull, Westport, Wethersfield, Glastonbury and many nearby areas in Connecticut, New York and Massachusetts. The US Department of Energy has reported that homes in colder climates can conserve as much as 30-40% on their energy bills by simply sealing their windows. And what windows are less energy efficient than the ones in your basement? Think of it this way: You have just installed brand new steel, single-paned basement windows in your home. Even brand new, steel, single-paned windows have an R-1 rating. R-1 rated materials stop 50% of the heat that reaches them from passing through. Older basement windows will have an even lower insulation rating. If you have old windows that have rusted, rotted, or corroded frames, then energy is literally pouring out of your home through them. Our Advanced Energy Panels can provide a permanent solution to this problem with one fast, easy installation. Whether you live in Stamford, Norwalk, Yonkers, Danbury, New Haven, Springfield, Holyoke, Westfield, Greenwich, Mount Vernon, Trumbull, Norwich, Groton, Glastonbury, Westport, Wethersfield, Torrington or nearby in Connecticut, New York, or Massachusetts, our basement experts are ready to help you! If you'd like a free, no-obligation basement window insulation quote, call or e-mail us today!